The world premiere recording of the complete score from the Lord Grade Film starring Jason Robards, Richard Jordan, David Selby, Anne Archer and Alec Guinness. Raise The Titanic was filmed in 1980, and although expensively mounted, at an estimated $40 Million, the production retrieved only $7 Million in receipts on its initial release. The dismal box-office response, fuelled by universally poor critical reaction, seems justified; the film, despite being ambitious and professional, failed to ignite the explosive elements of the original novel by Clive Cussler. 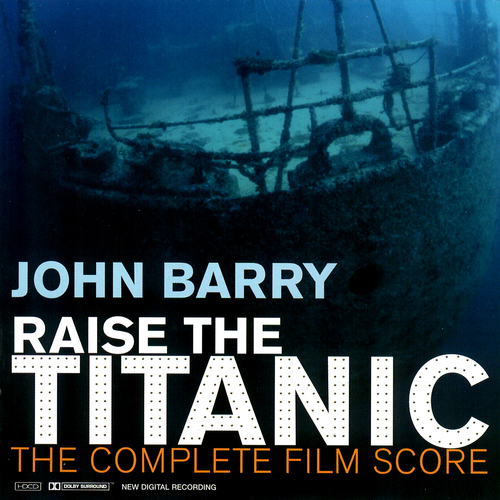 However, composer John Barry's elegant music for Raise The Titanic has cruised on to plaudits and kudos, his musical score recognised as a prime example of the film composer's art. Over the past 19 years, Raise The Titanic has not only been one of the most requested of John Barry's unrecorded scores, but one of the most requested scores of all time. "Overall this is an extremely well produced, and thoroughly listenable representation of one of Barry's finest scores with accurate interpretation, smooth performance, and sumptuous sound. Classy CD presentation includes superb notes from David Wishart which feature a cue by cue synopsis of both film and score. It was worth the wait." John Barry - Deep Quest / Flood!